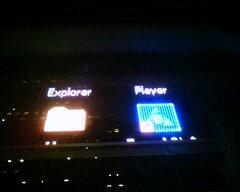 Day one of SES New York included some interesting sessions. A morning session on Searchonomics offered some interesting metrics on the study of search behavior, with Geoff Ramsey of eMarketer and Bill Tancer of Hitwise making the potentially snoozer topic of search behavior seem fascinating. If you want to understand how and when people look for things online, these are the people who know, from the inverse correlation between searches for hybrid cars and SUVs to the fact that the peak searches for diet sites happens on January 1 and drops consistently throughout the year, bottoming out around the end of November every year. Podcast Search hit closer to home with Daron Babin of Webmaster Radio, Ethan Fassett of the Yahoo Podcast Search team and Amanda Watlington of Searching for Profit covering topics related to making your podcast easier to find in the search engines. This is much more complicated than simply submitting a podcast to iTunes and hoping someone discovers you. Darin is a particularly good resource for SEO and audio, as someone who's worked in the search marketing industry for several years while also operating a Web radio show long before podcasting came into the picture. Much of what was discussed during the session echoed things I've said about podcast search in the past, with an overview of key points made in Podcasting Starter Kit. So far the portability experiment in traveling with the Fujitsu Lifebook P1510D is working out nicely. The hardback book sized laptop is handling all my normal computing duties like a champ. The one thing I hadn't tested was the onboard Bluetooth for connecting to the Internet using the Cingular EDGE service on my cell phone. Apparently Fujitsu forgot to include the configuration utility, but I have an external Bluetooth adapter from Kensington so I'm connecting anyway. Battery life is holding up nicely. I used the Lifebook with both Bluetooth and WiFi off and on for about 7 hours today without running out of juice. I'm feeling confident in abandoning a more traditional laptop for the convenience of light weight and portability. On the way back from dinner tonight the SNY TV studio was either experiencing technical difficulties or trying to send a message to the MS offices in the building across the street. 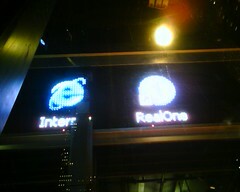 Even in Seattle, with Microsoft just across the lake, I'm almost positive I've never seen Windows icons on a marquee.